From the car’s advanced chassis to its fantastic interior quality and wide range of efficient engines, there’s so much to love about the Audi A3 range of cars, available here at Vindis. The entire Audi A3 range offers solid options for those looking for a medium-sized hatchback. Available from SE to S-Line trims, the A3 offers a range of personalisation to ensure that your vehicle stands out from the crowd. 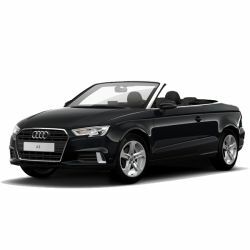 Audi also offer an A3 Cabriolet and an A3 Saloon, whilst the S and RS models round up the collection with more aggressive styling and power. Whichever style you choose, rest assured that you will receive the keys to a vehicle that instantly catches the eye with its stylish lights and large grille. The inclusion of a simple-yet-trendy dashboard — complete with 5.8-inch infotainment screen — and the use of high-quality material ensures more treats throughout the interior of the Audi A3. Browse through our full selection of new Audi A3 cars below and enquire about any that appeal to you online today.